4 week course $79.00. New session starts May 4, 2019. You may purchase the DVD compilation via Paypal for $20.00 + S&H at any time, including during initial registration. Have you ever wished you could control your pack of dogs? Have you ever wished that they wouldn’t all run you over at the door? Have you ever wished that they all exhibited some self-control? If you answered “yes” to any of those questions, then this online class is for you! Door etiquette – going outside, inside. Loading in vehicle – from home, from play. Group feeding – treats or dinner. 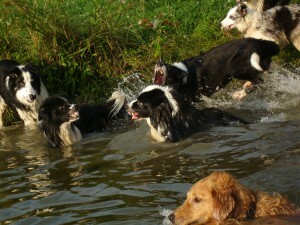 Group anything – grooming, attention, any activity that you do with all of your dogs. Helps with stays in general – for agility, for competition, for water work, for anything you can think up! Really teaches the dog to listen for their own name. Helps with dogs that think all of the food/toys/resources are theirs. Helps to teach the dogs self-control. There are a total of 15 lessons, along with 19 video clips. I will be spreading these out over a 30 day period. Each lesson will include text and a video clip(s). You will have a total of 40 days to come back to the site to re- read and watch the video clips. You will be able to post questions, problems or comments to the blog. I will be monitoring the blog and will answer all questions as soon as possible. Because dog training is such a visual thing, I encourage you to video tape yourselves and your dogs if you are having a problem, post it to Youtube.com and then add you link in comments so we can all look at it and discuss it.